Sports Illustrated cover of Pete Rozelle from January 6, 1964. No man was more important for the rise of the NFL during the television era than Pete Rozelle. The "PR commissioner", Rozelle guided the league for almost thirty years. 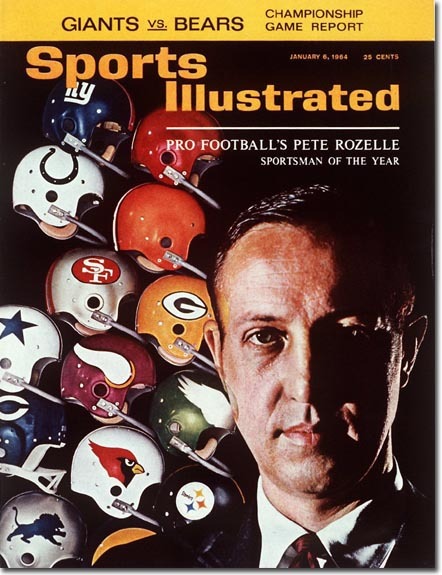 In 1964, just four years into his tenure, Rozelle was named by Sports Illustrated as its "Sportsman of the Year" in recognition of his work growing the NFL while keeping its public image clean by suspending players who had bet on their teams for the 1963 season. Sports Illustrated Cover. 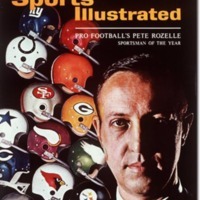 “Pro Football’s Pete Rozelle: Sportsman of the Year.” Sports Illustrated, January 6, 1954. http://www.si.com/vault/cover/1964/01/06, “Pro Football's Pete Rozelle: Sportsman of the Year,” The American Century, accessed April 20, 2019, https://americancentury.omeka.wlu.edu/items/show/139.